I wanted to pop in here to show you guys a project I did recently. Over the last few weeks, I've seen giant wall clocks popping up around the blogosphere. But when I started looking around for one to buy, I discovered they are quite expensive. Then I got the idea that I could DIY my own. The first thing I needed was a large round piece of wood. So I went to my local Habitat for Humanity Restore to look for a table top I could use. 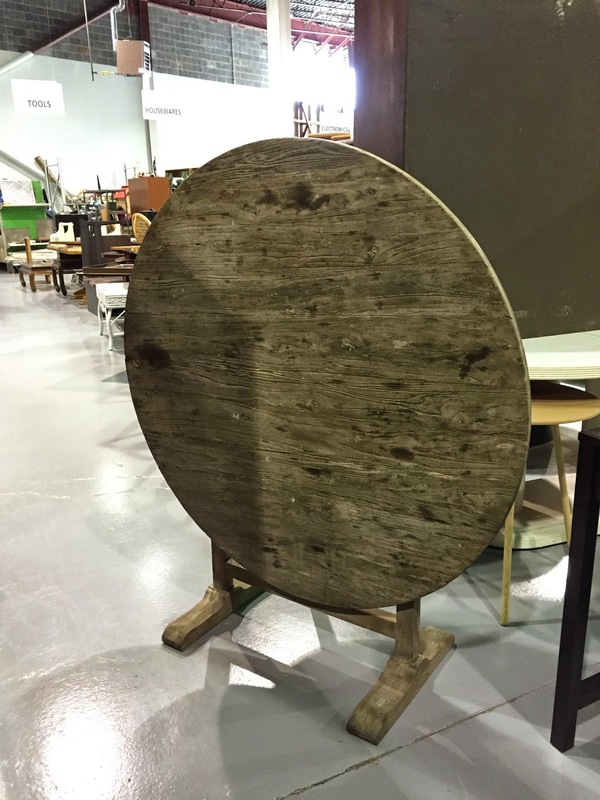 I found this wooden antique table and thought it would be perfect once I took the legs off. Plus the guy sold it to me for $25 which I felt was a steal. It's almost 4 feet in diameter, so it's large. I considered leaving it the natural wood because I loved the aged look it had, but it blended in too much with the color of my wall and I really wanted it to pop, so I decided to paint it white. I printed out the Roman Numerals "X, V, and I" in a font and size that I liked. Then Tim figured out the center of the circle so I could find the correct placement of my numbers. This was the hardest part and it took some trial and error. And it's definitely not perfect. 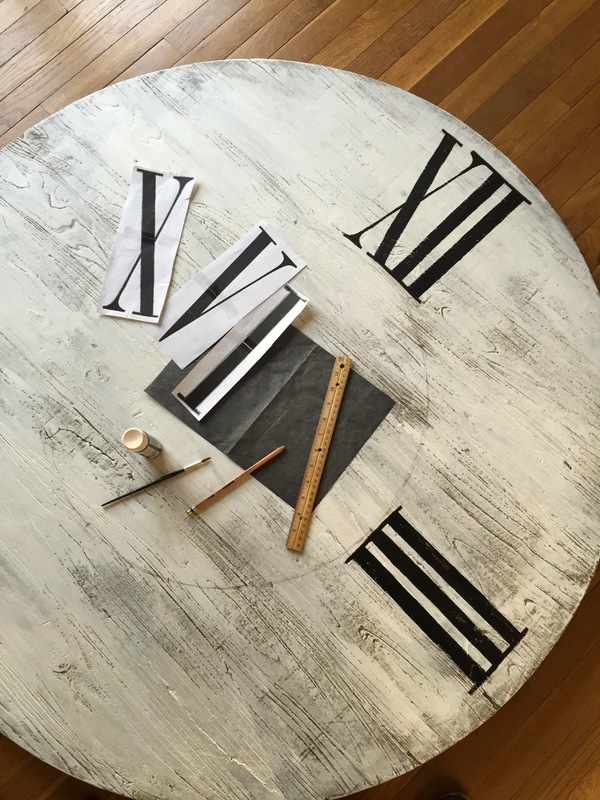 I used tracing paper to trace the numerals onto the clock and then painted them in. And finally, I gave it a good distressing. We have a large blank area on the wall in our entryway and I've been wanting to put a large statement piece there, so this is where Tim hung it up for me. I know there are clock kits you can buy to turn it into a real working clock, but I'm kinda loving it the way it is right now. Love it. It looks so good on the wall! I'm pining it for a future DIY! I don't remember. Sorry! I know I tried out several until I found one that was tall and skinny. Looks so good! Very inspiring as I'm looking for a large clock and do not want to spend $300 for one.